* Length: Crown 5"; Bang 4. "; Nape 1.5"
Layered and fabulous. Straight, long layers throughout the crown and gently tapered nape will give you a sense of style and flair. 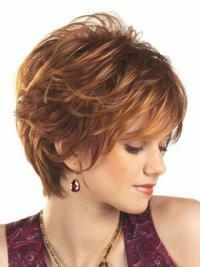 This style offers maximum versatility, it can be sleek for a more formal look or finger-styled for a casual look. what a wavy amazing wigs!! the length fits me perfect! its in a good shape so that i can wear it right now,don't need to be cutted.the delivery is fast that i can wear it on my party tomorrow. thanks very much UrHair.